Having just attended the Green Data Center Design Conference in San Francisco I came away with a few observations. First, although this was a relatively sparsely attended event there were some "heavy hitters" present. Microsoft and eBay both had presentations and representatives in the house, as well as Digital Realty Trust, APC, and Intel. Other members of the audience seemed to include users and providers in the "middle tier" data center class. It was this "middle tier" that received some attention from APC during their presentation. It was noted that this class of user with facilities in the 2,500 to 10,000 square foot range are not adopting "best practices" as demonstrated by the Microsoft's and Google's of the world. Some of this might be attributed to lower capital budgets but more likely to the slow spread of information about what can be accomplished. PUE numbers in the mid-2s to over 3 can be found in these facilities while large leading edge companies are operating in the mid- to low- 1s. The term "PUE" itself came under some scrutiny as the right metric for measuring data center performance going forward. Part of this is the thought that other factors ought to be considered such as water usage (the "WUE") but the single biggest reason PUE is being questioned is the massive under-utilization of servers in virtually all data applications. Most of the experts speaking at this conference put utilization factors in the range of 10% to 15%. PUE is calculated based on total installed server capacity...not actual capacity in use. This not only results in PUE numbers that are grossly overstated but also in tremendous wasted capital dollars and far oversized infrastructures such as HVAC. As for future trends in data centers and large server rooms the consensus also seems to be that "virtualization" will become more commonplace as a means to drive up utilization. "Cloud" services will have the same impact both for public clouds and private, corporate, clouds. This will result in reduced demand for more space for many companies as they begin to use what they have more effectively. Although one presenter suggested that this will cause a dip in construction demand the others seemed to believe that the rapid growth of data consumption will simply outstrip the rate of virtualization and still create demand. In the cooling/HVAC arena the other trend that was presented by the major players was the rush to "chiller-less" design. Whether this was pure 100% outside air solutions or evaporative cooling solutions the key was to eliminate the chillers, DX equipment, and all of their ancillary equipment costs and complications. 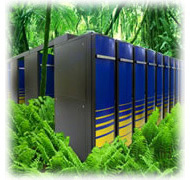 Data center specialists from eBay and Microsoft repeatedly pointed out that modern servers are designed to withstand operating temperatures approaching 230 degrees C. The ASHRAE TC 9.9 guidelines just introduced proposed server inlet temperatures of over 110 degrees F for some applications and the most stringent conditions were still around 81 degrees F. eBay commented that their failure rate of components in chiller-less designs is barely greater than in their legacy designs and was more often caused by vibration or software issues than temperature issues. Humidity control was also questioned and an engineering manager for Digital Realty Trust commented that he has seen no problems with relative humidity levels down around 20%. There seemed to be no upper limit that concerned the DRT engineers and they were strongly proposing evaporative ("adiabatic") cooling for their future data centers. Using a system such as the Aztec indirect evaporative cooling system would easily produce temperatures in the ASHRAE guideline range and do so without introducing more moisture into the data center environment.